Ok. I know I have been absent from the blog for awhile. I am working on a new blog layout, but for now, this will have to work! For those of you who didn’t know, we gave up meat for Lent this year. We are eating vegetarian Monday-Friday, and fish on the weekends. It has been challenging, but at the same time, it has given us an opportunity to try some new recipes – like these Lentil Burgers! This was definitely one of those recipes that I thought would be a total bust, but much to my surprise, these were a huge hit at our house! This recipe makes enough for our family of 5, plus leftovers for lunches. (My kids really liked taking these in their lunches.) This recipe is gluten-free, dairy-free, and vegan if you use egg substitute. 1. Combine 4 C water with lentils, and bring to boil over medium-high heat. Cover and simmer until lentils are tender, 15-20 minutes. Drain. 3. Put mashed lentils in a bowl, mix in garlic, cumin, curry powder. Mix in beaten eggs (or egg substitute). 4. Shape patties and place on a plate or cookie sheet. Chill in the refrigerator for 10 minutes to make them easier to fry. 5. Dredge them on both sides with cornmeal. You could also use a mixture of cornmeal and flour. 6. In large frying pan, heat oil over medium-high heat. Fry patties, turning once, until brown, about 3-4 minutes on each side. Serve with pitas, hummous, and tzatziki. We made some Greek-spiced potatoes and sauteed red peppers for a side. This meal will probably become a staple at our house! This year we celebrated St Patrick’s day at the community parade in Maynooth, County Kildare. Maynooth makes a delightful outing because it’s a 20 minute train ride and the station there has a big playground. Today being St Patrick’s day there was also a parade complete with Irish dancers, marching bands, boy & girl scouts, trackers and fire trucks. The kids enjoyed about the first hour of floats but then were ready for the playground. 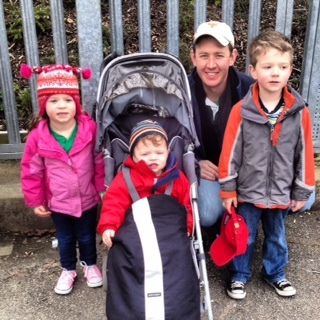 Waiting for the Maynooth train….and wearing green under the coats. 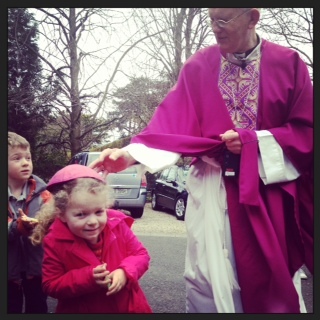 In other news, Bishop Walsh celebrated Mass at our parish this weekend. Liesl asked him afterwards why he didn’t wear his “special hat” (mitre). He told her that he just brought his small hat (skullcap) and offered to let her try it on.